Japan Farmers Markets: Possum Coop? Yesterday, though, these little fellows put their names on my list. My list of things that need to go, that is. I returned from a run around our country block to see two opossums eating from the chicken feeder. I walked up speaking loudly, and one darted between the coop and the barn, and the other (this is where I absolutely shrieked!) went directly into the coop. I bounded over and quickly opened the roof to find...just the opossum. Sitting in the bottom nesting box like a furry chicken with a ratty tail. My greatest relief came when I saw the girls standing in an empty bay of the woodshed just behind me. Whew! Now, I just needed to get the opossum out of the coop. Easy. I live in a fantasy world of logical small animals. I tried shooing the opossum out. No go. I gently poked the opossum. It ran out of the nesting box and climbed on top of another one where it waited. I don't know what it was waiting for, so I tried tipping the box with the stick. The stick slipped and the opossum fell between the wall and the nesting box. No injuries except perhaps to the pride of both of us. I finally tipped it over, and it ran back into the first nesting box. At this point, I simply lifted out the entire box and set it down in the snow. The opossum ambled out and into the barn. Not rushed at all, but I'm sure it had a headache. 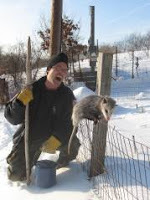 The other opossum was still between the barn and the coop, and hissing at me. It would not budge despite a little gentle poking, and moving things out of its way to encourage progress. No go. Meanwhile, the girls behind me started making those "I'm ready for bed, how about you?" sounds, and walking toward the coop. Good grief. Any other time I want them to go to bed, it's an Olympic feat to catch them. So, I closed the door to the sound of a hissing opossum, and then lifted the girls in to their roost. Thankfully, that was very easy. They must have been tuckered out after a day in the sun. A little more poking, and the second opossum started on its way. And now we've got the live trap out and ready. Oh, my gosh...I know I wouldn't like to run into a possum in my coop. I know they will eat baby chicks...but would they harm an adult hen? I trapped one in my garden last summer...it went in after the peanut butter and bread I put in to catch squirrels. I love your blog, by the way. Funny story - and told very well! I can just see you out there possum pokin'! How did you get that photo of Richard and his phurry phriend? Hi Kateri, Word on the dirt road has it that they wouldn't necessarily go after a hen, but if they develop a taste for chicken there is no turning back. I'd prefer not to kill them, but rather encourage them to stay away. Hence, the live traps, and strategic placing of chicken feed. We'll see what happens now with all this warm weather. Thanks so much for the kind words, too! Hi Cathy, The poor possum was trying to pretend not to be there, so we just went right up. Poor little guy/gal. Great story, hopefully the heat wave will have them out and about so you can trap them. I'm awaiting the wildlife trials in the garden up north. I know there is a least one raccoon because we've found tracks and lots of deer but who knows what will be scared off by the construction and our two dogs moving in.